2016 has been the year of the political meme. No scandal, no matter the size or the gravity, would be complete without social media chiming in. Not a group to stray from convention, the LGBTQ Twitter community is abuzz with the latest hashtag poking fun at this year's stranger-than-fiction political happenings. These seven tweets from #LGBTQHatesTrumpParty prove how much the community really, really dislikes Donald Trump. In response, many LGBTQ users took to Twitter to express their disdain for Trump's alleged support of "gay rights" in the most hilarious fashion: with a hashtag which not only shows just how outrageous his claims are, but also how much my fellow queers and I enjoy a good party. Below are some of the most hilarious tweets in the #LGBTQHatesTrumpParty thread. I don't know about you, but I definitely wanna go to this party. Trump supporters could surely take some dance lessons from the attendees of the #LGBTQHatesTrumpParty, who prove one dance at a time just how much more they're #winning. Washington, D.C. held its Democratic primary Tuesday, and Clinton won by a wide margin. D.C. is also home to one of the nation's largest LGBTQ populations. Coincidence? I think not. So not only is this vintage GIF excellent, but Alec Mapa, the "gaysian" comedian who tweeted it, was a friend of my mom's in high school. The world is small, and the gay world is even smaller. Seriously, this would make my life. Get on it, Hollywood! If "not today, satan" doesn't become the anti-Trump slogan by November 8, I'm leaving the country. He looks good as a drag queen, no? 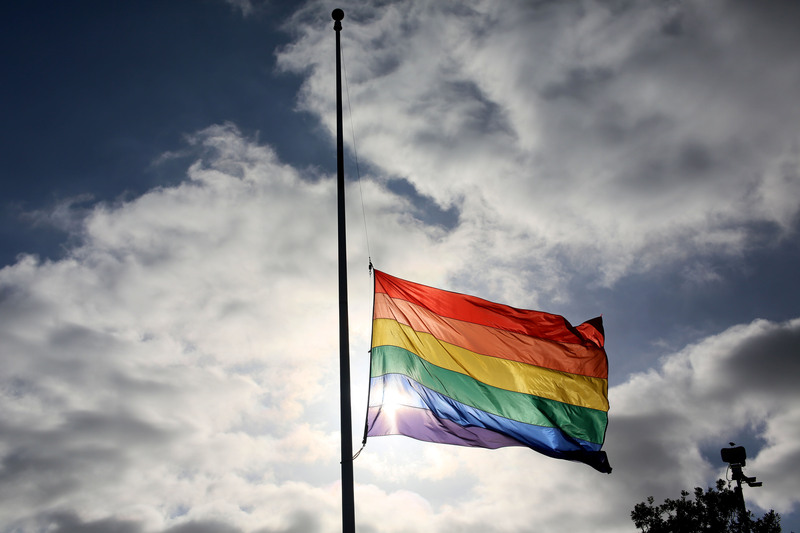 As the LGBTQ community continues to mourn those we lost in the Orlando massacre, it's important to remember to laugh, love, and keep fighting in the face of terror and hate. If that means holding a huge party making fun of The Donald, then so be it.